Covered in a mixture of garlic, black pepper, and cayenne, barbecued crab is a regional speciality you won’t soon forget. Barbecued crab, a coastal delicacy born in a tiny corner of Southeast Texas, is tender, juicy, and laced with spice. This misnamed meal isn’t barbecue, though, which I realized some years ago when my friend Carolyn invited me home from college to visit her family in Beaumont, promising we’d eat something not found anywhere else. Floyds serves barbecued crab from about July through September, when blue crabs are in season. On a mild spring evening, her parents piled us into the car for a 45-minute trip from their Beaumont home down to Sabine Pass, where we pulled up to a local shack called Sartin’s and stood around for about an hour before a table opened up. I breathed in the salty air, looked at the fish swimming beneath the aged dock beside the small café, and marveled that people would hang out and chat about nothing for what seemed to be forever, while waiting to eat something that sounded nonsensical. After finally being seated at a long table, we waited some more. Eventually, a waitress arrived carrying two giant trays piled with searing-hot crabs—Gulf blue crabs, pulled that day from nearby waters—bearing an enticing and foreign aroma. 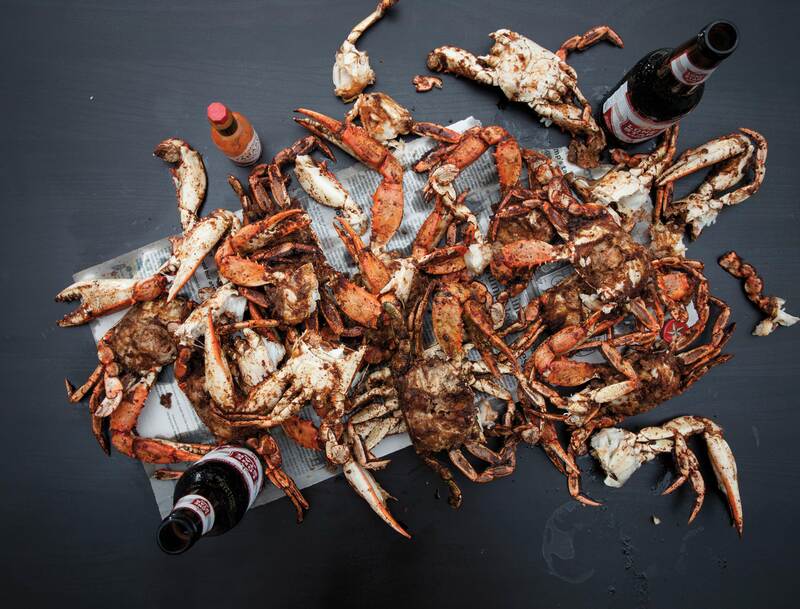 The blackened-everything craze from Louisiana had yet to blanket Texas, and the scent of that powerful blend of cayenne and garlic cooked into these bright-red crustaceans was heady and irresistible. Nobody could explain why these shellfish were called “barbecued,” because they were neither smoked nor grilled—and there wasn’t a trace of barbecue sauce anywhere to be found. 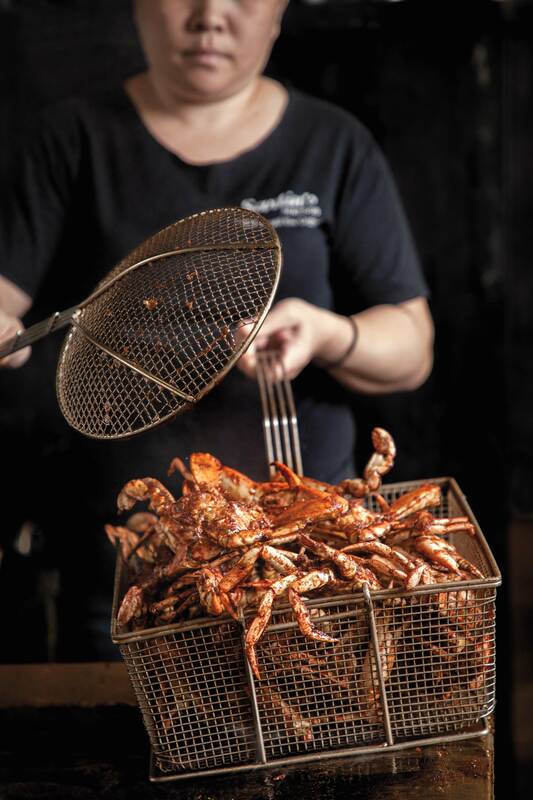 The one similarity is that eating barbecued crab is messy as all get-out, perhaps more so than a slab of ribs, because the heavily seasoned crustaceans are served right out of a molten-hot deep-fryer. Carolyn and her parents showed me how to crack the crabs to pull out the meat once they were cool enough to handle. It was a process; I remember being a little envious of their prowess. Crabs fresh from the deep fryer. In the years since, that particular Sartin’s closed, but I’d heard that other locations survived in the Beaumont area. I kept promising myself I’d return to see if these crabs lived up to my memory; motivation kicked in when I heard there was but one Sartin’s still in business, and the specialty was becoming scarce. After talking my husband into a barbecued crab mission, we set out for the Golden Triangle. The scent of that powerful blend of cayenne and garlic cooked into these bright-red crustaceans was heady and irresistible. We stopped in the remaining Sartin’s, which operated in Nederland for 21 years. (In May, well after my trip, Sartin’s relocated to a mall in Port Arthur.) The visit took me on a delicious, messy journey back in time with every bite. We were mesmerized by cook Elaine Tran’s preparation of the barbecued crabs. She’d already done the hardest part, which involves stunning the live blue crabs in icy water before pulling off the carapace and apron. She then covered the crabs in seasonings and, grabbing them with tongs, lowered them into searing-hot oil to fry about a minute. Sartin’s models its seasoning recipe after one developed by Granger’s Restaurant, the Sabine Pass seafood joint that invented barbecued crabs in the late 1940s and burned down a decade later. Granger’s original black pepper, garlic, and cayenne recipe is said to have vanished, but you can still buy Bolner’s Fiesta brand BBQ Crab Seasoning if you want to master this dish at home. As we continued on our barbecued crab adventure, we finally became better at the technique of eating the shellfish, which requires a bit of practice to get right: With one hand, you grip the body and, with the other, pinch the place where a big front leg attaches (using napkins—those babies are hot and slippery! ), and break them apart to reveal lush, thick shreds of white crab meat. My favorite addition to the ritual came in drizzling each bite with a squeeze of fresh lemon wedge. Our weekend continued with more barbecued crab discoveries, and each came with its own round of gustatory joy. At The Schooner, a large seafood house alongside a busy Nederland highway, the barbecued crabs shared space on a large oval platter in a jumble with big, butterflied and fried shrimp, scallops, and stuffed deviled crabs. Owner Constantine Megas spoke with humble pride about the recipes that have become traditions since his family took over the then-3-year-old restaurant in 1950. Its barbecued crabs bear a less spicy and slightly sweeter seasoning combination made just for The Schooner by a Beaumont food company called TexJoy. The Schooner also cooks exceptional gumbo, a nuanced dark bowl of roux packed with meaty shrimp, crab, and crawfish. Aside from barbecued crab, Floyds in Beamount is known for its crab bisque. At loud and crowded Floyds Cajun Seafood in Beaumont, we started with a bowl of the much-touted crab bisque, which general manager Paul Knobloch insisted we try. Good thing we split this lush, creamy indulgence, or else we wouldn’t have had room for the main event. Steam wafted from the giant platters set before us as the crabs—piled at least three deep, with more than a dozen to a platter—had come seconds earlier from the fryer. Floyds’ version was as spicy as Sartin’s, with most of the seasoning clustered around the center of the crabs and less on the legs. Knobloch claimed his proprietary recipe, made in house, is a 75-year-old secret dating back to another long-gone South Louisiana shack connected to the Landry’s seafood restaurant family. We listened and nodded, tearing apart the crustaceans, squeezing lemon on each piece then taking another bite of the warm, addictive garlic toast served on the side. We washed it down with cold Abita Amber, that refreshing lager for piquant Cajun foods. Finally hitting overload, we pointed the car toward home, agreeing not to wait years before returning for another barbecued crab weekend. We’ve since heard from our Southeast Texas pals about other great crab destinations. 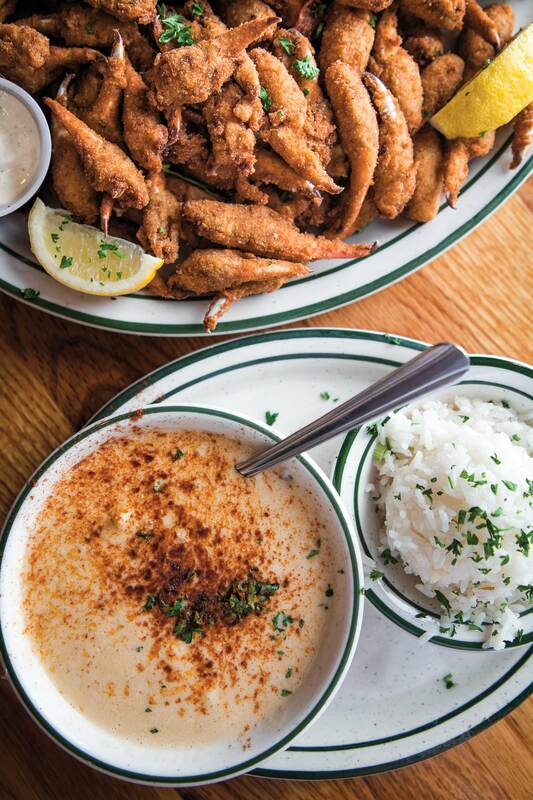 The only thing we can’t agree on is where to stop for our first crab fix.